We're a talented team of designers, developers, videographers & copywriters that love nothing more than to tell a company's story in the most powerful way possible. Hi. We’re MeeCreative, a full service creative agency with a knack for great ideas that help businesses grow. Based in South Wales, but with a portfolio of clients that spans the UK, we are building a reputation as one of the most creative and effective Branding & Communications agencies in the country. Our talented team of designers, developers, videographers and copywriters love nothing more than to tell a company’s story in the most powerful way. If you’re a small business with big ambitions then yes. Absolutely yes. If you’re a bigger, established brand looking to spice things up a little then also – yes. If you’re looking for a set of top quality leaflets to drop around your neighbourhood…perhaps not. But we can help you with some better ideas for your marketing. We do it all in-house. We’ve got all the doodlers, the techies, the wordsmiths, the marketers and the camera guys under the same roof. In short, whatever you need, from a new website to a fully-fledged rebrand, we can do it. We’ll all come together to work towards the same goal, with the same brief. Not all agencies can say that. You’d be surprised. Yes, working in a big team can be hard. Videographers make rubbish tea for a start. But the end result is a coherent, consistent and powerful brand strategy that gets results. It means that we work hard to make sure your audience sees the very best of you in everything that you do. It means that when the time comes that they need the product or service you offer it’s you, not your competitors, that they think of. Our powerful branding ideas have helped some of Wales’s largest companies increase their turnovers tenfold. Want to see what we can do for you? Give us a tinkle. Work we produce, things we love and….everything in between. To discuss a project, creative issue or just to chat, please get in touch. Our studio is a professional and creative fast paced environment. We’re always looking for the right people to join our growing team. By right, we mean able to fit seamlessly into MeeCreative and join the buzz we’re creating. Although we’re not actively recruiting right now, we’re always happy to hear from people who feel they can contribute towards what we’re committed to achieving with MeeCreative. We regularly call upon our bank of freelance designers who have been handpicked for their raw talent as well as their ability to get stuck into a project from the word ‘go’, delivering work that we can we proudly put our name to. 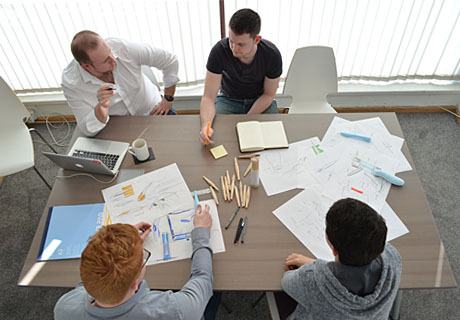 We usually take on two Product Design undergraduates as part of their degree course for a year-long placement. Recruitment for these positions begins in April, so please check back then for more details. If you would like to discuss how MeeCreative can provide design services for your company, get in touch!